Paediatric Biomechanics and Motor Control brings together the very latest developmental research using biomechanical measurement and analysis techniques and is the first book to focus on biomechanical aspects of child development. 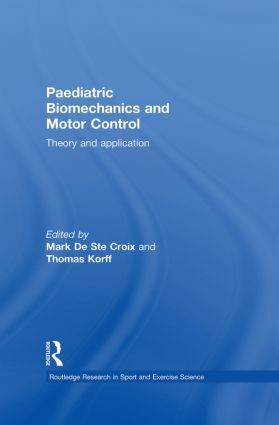 The book is divided into four main sections – the biological changes in children; developmental changes in muscular force production; developmental changes in the biomechanics of postural control and fundamental motor skills and finally the applications of research into paediatric biomechanics and motor control in selected clinical populations. Written by a team of leading experts in paediatric exercise science, biomechanics and motor control from the UK, the US, Australia and Europe, the book is designed to highlight the key implications of this work for scientists, educators and clinicians. Each chapter is preceded by a short overview of the relevant theoretical concepts and concludes with a summary of the practical and clinical applications in relation to the existing literature on the topic. This book is important reading for any sport or exercise scientist, health scientist, physical therapist, sports coach or clinician with an interest in child development or health. Mark De Ste Croix PhD, is a Reader in Paediatric Sport and Exercise Physiology, Department of Sport and Exercise Science, University of Gloucestershire, UK. Thomas Korff PhD, is a Senior Lecturer in Biomechanics, Centre for Sports Medicine and Human Performance, Brunel University, UK.